The history of the West Indies sugar and slave trade has left an indelible mark on Jamaican society. The island’s 3 million inhabitants, mostly black, remain sharply divided along racial and economic lines. The Chinese, who arrived as indentured servants in the 1840s (after Britain abolished slavery on the island) then left the plantations to open up shops, are scapegoated as “economic oppressors” and derisively called “dog-eaters.” Affluent white landowners lament the nation’s state of disrepair with an air of detached colonial superiority. A post-colonial reform effort by the white socialist Prime Minister Michael Manley, Thomson notes, ended eight years after his 1972 ascent to power in a violent election that claimed 800 lives. Indeed, the “guns, guns, guns” are as unavoidable a topic as the tourism that keeps Jamaica afloat. On Kingston’s lawless streets, gangs war with firearms imported from the US. Jamaica ranks with Colombia and South Africa among the world’s most murderous nations, and drug cartels often serve as brutal stand-ins for a feckless police force. “The Dead Yard” refers to a nine-day mourning period practiced by some Afro-Christians to see souls off to the afterlife, but as Jamaica is nicknamed the “yard” among locals, the title’s broader meaning is clear. In 2009, when Thomson’s book hit shelves in Britain (its US release is today), it was met with acclaim, but also criticism for painting such a dark portrait of the island. The new edition will do little to change that impression: It opens with a preface detailing the US government’s five-week manhunt for Kingston drug kingpin Christopher “Dudus” Coke, which incited violence between local police and gangs. When Coke, who is seen as a Robin Hood figure to Kingston’s poor but a cold-blooded criminal to the feds, was finally captured more than 70 people were dead. Thomson does not fill his book entirely with doom and gloom. He takes a special interest in Jamaica’s rich culture of reggae music, naming each of his book’s chapters after a song—”007 (Shanty Town),” for instance, examines the entertainment world’s interest in the island. He also celebrates Jamaican poets—Evan Jones and Benjamin Zephaniah among them—using their words to color an impression for the tourist curious of what Jamaica contains beyond its isolated resort paradises. But Thomson’s claim that the nation has “no religion or civilization of its own” may be precisely what the old woman warned him against at the outset. At the end of his travels, Thomson concludes that the island is caught in a struggle for identity, crippled by violence and the remnants of slavery. “Jamaica needs to banish its psychological dependency on the Mother Country—’Auntie England’—and haul down the Union Jack” to break free from its post-colonial rut, he writes. How that’s to be done isn’t entirely clear. 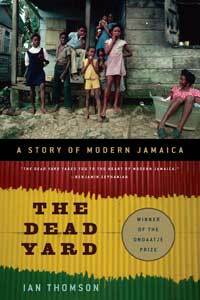 But in The Dead Yard Thomson provides a thoughtful and engaging primer on the tribulations that have shaped and continue to affect modern-day Jamaica. Why Do Men Write All the Book Reviews?